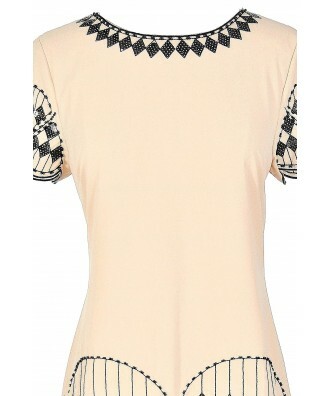 The bold diamond shaped embellishments against a beige background really make this shift dress pop. 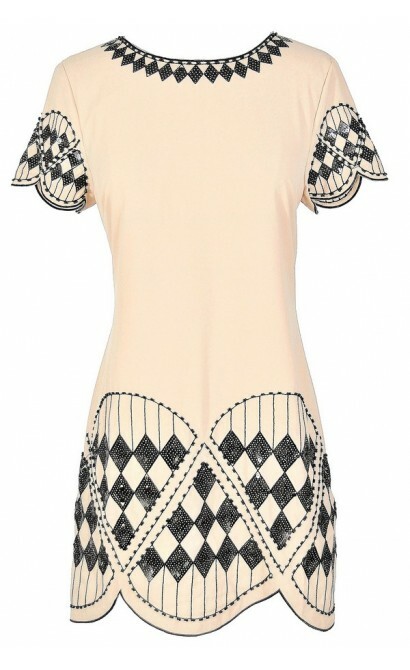 The Harlequin Diamonds Black and Beige Embellished Shift Dress is fully lined and made of a silky fabric in beige. It has a rounded neckline and roomy shift cut. This flattering cut is a great classic shape that manages to look great on everyone! The best part of this dress has to be the embellished design at the neckline, sleeves, and bottom hem, made entirely of black sequins and seed beads. 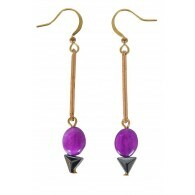 The diamond shapes give this dress a whimsical harlequin feel. A hidden back zipper completes this dress. 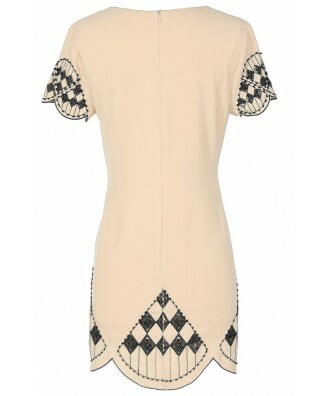 The Harlequin Diamonds Black and Beige Embellished Shift Dress would look perfect worn with black pumps. Try pairing this dress with black tights and pumps for a put-together stylish look. Details: Fully lined. Hidden back zipper. 100% polyester. Dry clean only. Small measurements: Length from top of shoulder to hemline: 32”. Bust: 34”. 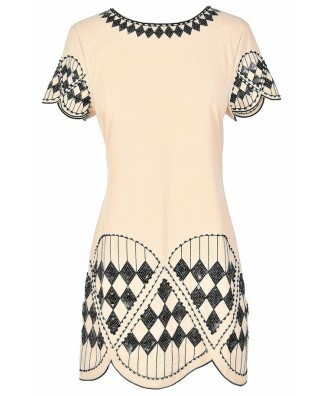 You have added Harlequin Diamonds Black and Beige Embellished Shift Dress into Wishlist. 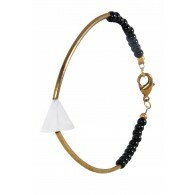 You have added Harlequin Diamonds Black and Beige Embellished Shift Dress for Stock Notification. You have set Harlequin Diamonds Black and Beige Embellished Shift Dress as a loved product. 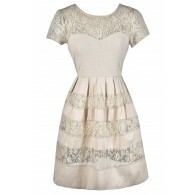 You have removed Harlequin Diamonds Black and Beige Embellished Shift Dress as a loved product.